It's just me and Maggie for dinner on a little date night tonight and she loves a good pork belly as much as I do. After reading Lucky Peach, I've been having a noodle craving. I'm going to get around to making some ramen at some point, but for tonight it's a simple noodle combined with some favorite ingredients perfect for a warm summer day. Mix everything together and let sit at least 20 minutes and stir again before using. It will also keep for a few days or even up to a week in the refrigerator. I had a small piece of pork belly from Uwajimaya, again my favorite place to buy it because it has less fat and is more meaty, but you will have to remove the skin first or have the butcher do it. I seasoned it generously with a mixture of equal parts kosher salt and sugar and set in the refrigerator for several hours. If you planned ahead, you should do this the night before, but I had not, so a few hours will have to do. Heat the oven to 450. Drain an liquid that has come out of the belly, brush off any remaining excess salt/sugar and roast in the oven for 2 hours. Turn the oven down to 250 and cook for another hour or so. My oven retains heat really well, so it would take quite a while for it to cool on its own. So, I usually pop the oven door open until it reaches 250. Let the pork belly rest about 15 minutes or so before slicing. Prepare your vegetable and pack them into a jar, container, separately, and pour the brine over top. I let them sit at room temp until cooled and then into the refrigerator. These will keep for about a month in the fridge. So, I always have some on hand to use whenever I'm looking for a little pop to something fresh. Steep the shiitakes in boiling water for about 15 minutes, or until they are soft. Remove the shiitakes and strain and reserve 1 cup of the steeping liquid. Slice the shiitakes into 1/8" thick slices. Combine the steeping liquid and remaining ingredients in a large sauce pan and bring to a boil. Add the shiitakes and simmer covered for about 30 minutes, stirring occasionally. Let cool, discard ginger, and pack shiitakes and as much liquid as needed to cover them into a jar or other container. These will also keep for a month. I had some on the side with a scrambled egg this morning for breakfast. My addition to the ginger scallion noodles is a sesame soy sauce combining sesame paste, light soy, a bit of sugar and a little white vinegar. Cook your noodles according to the package instructions. I used cold fresh store bought ramen noodles. Run under cool water after cooking to keep them from sticking together. 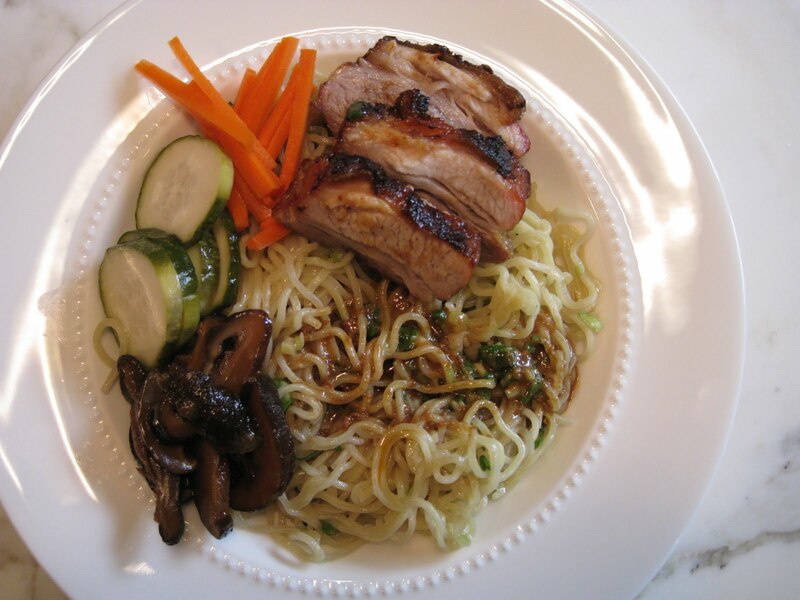 Toss with a spoonful of ginger scallion sauce, ladle a little sesame soy sauce and top with your favorite pickled vegetables (mine were cucumbers, carrots and shiitakes), and a few slices of pork belly. Noodle craving satisfied! Ruby had a broken tail feather yesterday and Allie and Rosie were pecking at the spot where she had bled a little. I guess once a chicken smells blood, it will continue to peck at the spot, sometimes until the other chicken dies. So, we had to separate them yesterday and today other than the times when they had free range of the garden. They are so close, they did not like being separated. They snuggled up to each other with the wire mesh partition between them. So sweet. Another sweet observation is that they like to dig a hole in the dirt, lay in it, and rustle their feathers and flip dirt on themselves. Bird bath!